Set in the heart of the ?Born Free Country? and home to the greatest wildlife conservationists Joy and George Adamson, the breathtaking Sarova Shaba Game Lodge has 85 exquisite chalets over-looking the Ewaso Nyiro River?s crocodiles. Mingle with the awe inspiring Samburu people, test your mettle at the Sarova Survivor Challenge; one of the most fun-filled team-building programs ever conceived, or simply marvel at the diversity of big game in this unique corner of Kenya. 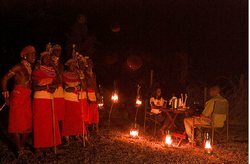 In the evening, spectacular dishes are served in the bush under the African stars, while the Samburu perform their soul stirring songs and dances.